Fossil remains of a Tyrannosaurus rex, a dinosaur species that became extinct due to extreme climate conditions at the end of the Cretaceous period about 65.5 million years ago. 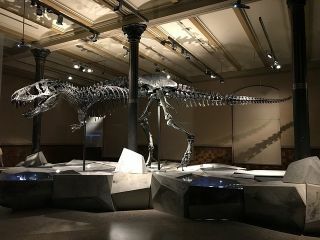 Dinosaurs such as Tyrannosaurus rex and Triceratops became extinct about 66 million years ago, after an asteroid strike resulted in plunging temperatures. According to a new study, the frigid weather that ultimately led to their extinction was far worse than earlier models suggested. At the end of the Cretaceous era, a massive asteroid — approximately 7 miles (12 kilometers) wide — crashed into a limestone- and gypsum-rich region, now known as the Yucatán Peninsula in the Gulf of Mexico. A new study estimates that the sun-absorbing sulfur — which vaporized into the atmosphere after the asteroid hit the gypsum — was three times more abundant than previous models estimated. Of course, the asteroid impact itself was terrible for local animal inhabitants, which may have perished in the crash's immediate aftereffects such as tsunamis and landslides. But the asteroid's impact site was an extra stroke of bad luck for the rest of the planet, according to Natalia Artemieva, a senior scientist at the Planetary Science Institute in Tucson, Arizona, and co-author of the new study. "The impact site in the current Gulf of Mexico had 3-km [of] thick sedimentary cover, a combination of limestone… and sulfur-bearing evaporites," Artemieva told Space.com in an email. "It's kind of a joke that 66 million years ago the asteroid fell into the worst possible place on Earth .... "would impact [have] occur[ed] into the ocean or into silicate rocks (such as granite), dinosaurs would be still alive." Imaging from NASA's Shuttle Radar Topography Mission 99 (STS-99) reveals part of the 10-mile-diameter (180 kilometers) ring of the crater. The numerous sinkholes clustered around the trough of the crater suggest a prehistoric oceanic basin in the depression left by the impact. The so-called Cretaceous-Paleogene extinction event wiped out many species, including all of the non-avian dinosaurs, according to a 2012 study by Paul Renne et al. According to a statement released by the American Geophysical Union, researchers often attribute that extinction event — to the asteroid collision that hit the Yucatán Peninsula, which combined with other forces of climate change - like the Deccan Plateau volcanic eruptions - to make for hostile global environments. The space rock would have thrown enormous amounts of dust, sulfur and carbon dioxide into the atmosphere, and it was the abundance of sulfur in these clouds that may have caused Earth's average surface air temperatures to drop by as much as 47 degrees Fahrenheit (26 degrees Celsius) in the long term. According to the new study, detailed Oct. 30 in the journal Geophysical Research Letters, the dramatically cooler temperatures lasted about three years after the asteroid impact. An artist's rendering from 1994, illustrating the Chicxulub asteroid impact that killed off most of the dinosaurs about 66 million years ago. Artemieva, co-author Joanna Morgan of Imperial College London and their team came across these findings by using a model that, according to the study, had "the capability to simulate the dynamics of different materials within the impact plume." The different materials displaced by the space rock each act differently when shock-waves hit them, so by fine-tuning the ejection models, the team could predict how much of each temperature-altering gas was ejected high enough to linger in the atmosphere upon impact. The team calculated only the gases that flew with a minimum velocity of 1 kilometer per second (0.62 miles per second, or 2,200 mph) into the atmosphere, because gases thrown at slower speeds were likely unable to reach a high enough altitude to influence the climate, Artemieva said. Older models with less computing power are therefore less accurate, she added, because they didn't isolate for a material's chances of staying in the atmosphere. Instead, the older models calculated all of the material that turned into vapor upon impact. Researchers now know that if material is vaporized, it doesn't mean it reached the atmosphere and caused climatic change, since much of it actually stayed near the crater. Recent geophysical studies, including more up-to-date information on how rocks behave under extreme conditions and various impact angle models, suggest the Chicxulub crater formed when hit at an approximately 60-degree angle. The revised data means more sulfur was ejected into the sky, the researchers said. According to Artemieva, volcanoes may offer insight into the effect this mineral has on Earth's climate when it gets pummeled into tiny solid particles known as aerosols. "Sulfur aerosols … cause cooling as they block incoming sunlight. Currently, the amount of CO2 and SOx [sulfur oxide] in Earth's atmosphere are balanced somehow, and we have our current (quite comfortable) climate," Artemieva said. Volcanic eruptions, for example, release a lot of sulfur into the atmosphere, which can cause local cooling, and even global cooling for one to two years, she added.